O’Leary nodded. “I think, given the performance of our rostering department over the last week, a description of me as a clown is appropriate in the circumstances,” he replied, matter-of-factly. It’s never a surprise to find Michael O’Leary’s name in the headlines. Frequently it is in connection with some controversy. Lately, however it has been almost exclusively so. The recent very public issues over flight cancellations and passengers being discommoded show little signs of abating. Through it all O’Leary has remained combative. His apologies have been minimalistic in style. 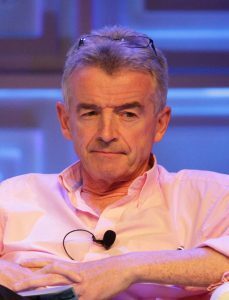 So who is Michael O’Leary? A look at his facial features from the perspective of Mien Shiang, the ancient Chinese art of Face Reading offers some interesting insights. Whether one looks at photos or watches him in action his features tend to be quite animated. This is both indicative of a lively mind and a reluctance to be pinned down. It is reasonable to assume he would be publicly scathing of any attempt to analyze him! His V-shaped hairline is associated in men with an innate capacity for solving complex problems. The resultant ‘flaring’ of the forehead to the sides can also indicate a tendency towards mediocrity. O’Leary has been known to issue flatly contradictory statements with no apparent concern for consistency. In his view it would appear that publicity of any description trumps all. The depth of the horizontal furrows across his forehead reveals a man who is quite self-aware. This is someone who has faced more than a few challenges and is comfortable making clear decisions. As his forehead is largely vertical we can take it that most of those decisions will be based on analysis and rational thinking rather than being governed by emotion. His eyebrows are thick and are close to being an inverted V-shape. The thickness shows his capacity to absorb considerable amounts of information, and the V denotes his autocratic nature, which is especially evident in public. There is a slightly rounded dimension to the V so we can also assume that some of his more abrasive public utterances are designed to trigger publicity and allow him have fun. A cluster of vertical hairs at the beginning of each eyebrow represent his ability to spot potential problems from the outset of any project. Given his outspoken nature we can be sure he will express his views forcibly. It may not always make him popular with colleagues but more often than not he’ll be proven right. Eyebrows sitting close above the eyes as his frequently are denote someone impatient to speak and likely to do so before their thoughts are fully formed. They tend to have very little patience with anyone who is long-winded or unprepared. His eyes vary wildly from being wide open to being narrow slits. As a rule we regard wide open eyes as a sign of emotional openness. In O’Leary’s case they appear more like a disruptive child challenging authority. More often than not his gaze is quite direct but largely conceals his feelings. The lack of visible fold in his upper eyelid is a strong indication of his lack of sympathy towards complaints. The above statement is similar in tone to many others over the years. My observation is that it is reflective of his worldview. His business life started at a young age when he spotted retail opportunities. Being self-sufficient and self-reliant has become part of his modus operandi, and he expects the same of others. Complaining about regulatory bodies is a matter of strategy. Personal complaints are another matter entirely. When we see ‘hooded eyelids’ we might be advised to tread carefully as their owner most certainly has a temper which they are not slow to express. The triangular shape at the bridge of the nose is, amongst other things a sign of his competitive nature. It may also be associated with self-imposed pressure. O’Leary will undoubtedly have expectations of himself and set challenging targets. It is not in his nature to simply sit back and watch the world go by. His nose is straight and the tip is not very rounded. The nostrils are large and visible when viewing him face to face. This combination of features confirms his directness of manner and tells us he deals in facts over emotion. We can also see that he enjoys spending money, but is likely to be quite discerning in his choices. There is an old Irish saying that a gap between the upper front teeth is a sign of a good singer. Never having heard O’Leary sing I can neither confirm nor deny that. The Chinese view is that such a gap indicates a willingness to take financial risks. After 9/11 when the world of air travel was in turmoil O’Leary backed his confidence in an upturn by placing a large order with Boeing. This at a time when airline revenues were plummeting. A thin upper lip is added confirmation of his head over heart approach. His chin is well-formed and juts forward slightly. This is not a man to give way or back down easily. His stubbornness has helped take him a long way. Whether the current problems around scheduling, angry passengers, and pilots making demands prove it to be an asset or a liability remains to be seen. Clowns have traditionally been regarded as a great source of entertainment. More recently they have come to be seen by many as a scary phenomenon. O’Leary probably veers between the two for many who observe his performances. In recent years across the globe we have instance after instance of business leaders and politicians falling from grace due to unethical behaviour. Bullying and fraud frequently go hand in hand. The causes of both behaviours are many and varied, and it is not my intention to investigate them here. My concern here is solely with spotting the signs and ensuring we do not expose ourselves to the pain and trauma of either. Has this person clearly demonstrated their trustworthiness and credibility? Who do I know and trust who can verify this? Do I feel intimidated or pressurised? Have I been fooled before? Can I afford to lose my investment? Remaining calm and relaxed is vital to ensuring we are not seduced by false prophets. We should also polish up our observational skills. Bullies and fraudsters are especially observant. Their eyes are alert for clues as to who will be a likely victim. Being calm and alert will allow you to spot them coming, and a key clue is in the eyes. In particular what we consistently see with fraudsters and bullies is a distinct coldness. Below is a series of eyes belonging to infamous characters from business and 1 from the world of sport. They share varying degrees of coldness, and one has an added dimension of anger. How many can you identify? It requires confidence to look someone clearly in the eyes and remain focused. Fraudsters in particular like to create doubt and confusion. It is always better to cultivate calmness, stay grounded and keep our intuition on alert – and practice, practice, practice your observational skills!